Should Amazon.com be considered one of the largest logistics companies in North America? The answer, according to most industry observers, is yes. And how big is that business? That question, unfortunately, can’t be answered definitively, at least not yet. 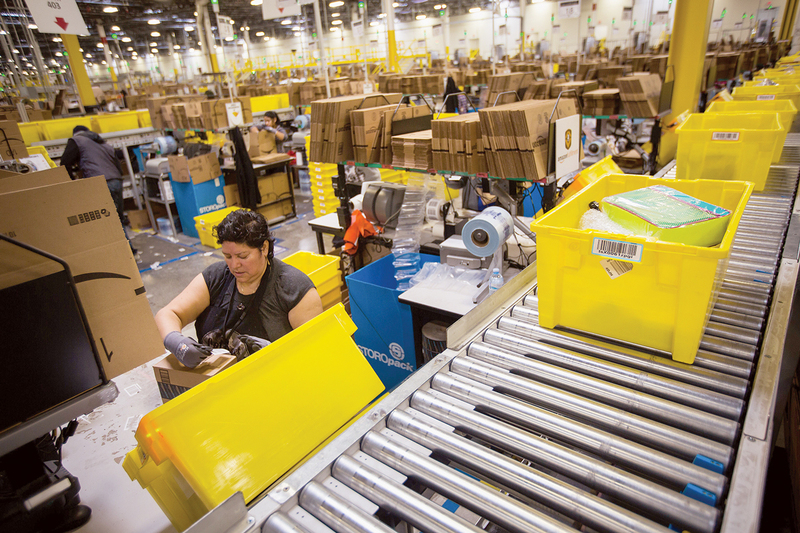 “Amazon is acting increasingly like a 3PL,” said Evan Armstrong, president of Armstrong & Associates Inc., a logistics industry research and consulting firm that recently published a detailed report on Amazon Logistics. Armstrong estimates that Amazon provides logistics services for 12% of business-to-consumer shipments worldwide, and he notes that third-party sellers account for more than half of all units sold through the Amazon platform. To serve those customers, Amazon has built an enormous network of warehouses and distribution centers with 386 facilities in the United States alone, including 159 fulfillment centers, 47 inbound and outbound sortation hubs, 52 Prime Now hubs and 115 local delivery stations, according to data compiled by Montreal-based research firm MWPVL International. Worldwide, Amazon has 850 facilities in 22 countries, occupying 220 million square feet, the equivalent of nearly 8 square miles, which is bigger than some small nations. By comparison, UPS Inc. operates just over 1,000 package handling facilities covering 68 million square feet. FedEx Corp. operates more than 1,200 package hubs and sort facilities, and its logistics unit operates 127 warehouses spanning 35.4 million square feet in the United States. According to Armstrong, Amazon offers several logistics services, including a signature program called Fulfillment by Amazon in which sellers ship goods directly to Amazon facilities, where the products are stored and where Amazon personnel arrange for transportation to customers once a purchase is made. In return, Amazon charges a commission of about 15% of the sales price of each item, per-unit fulfillment fees and monthly storage fees, Armstrong noted. Amazon also offers interna­tional transportation management services and recently added a service called FBA Onsite in which the company takes on management of inventory in non-Amazon warehouses. Satish Jindel, owner of SJ Consulting Group, an industry research and consulting firm in Warrendale, Pa., estimates that Amazon generated $42.5 billion in gross revenue from logistics services worldwide in 2018. That would make Amazon No. 1 in the world, Jindel argued, beating out Germany’s Deutsche Post DHL’s gross revenue of $30.6 billion and Switzerland-based Kuehne + Nagel Inc.’s $24.9 billion. For its part, Amazon consistently has declined to provide data about its logistics services. “I don’t have any information to share at this time,” company spokesperson Rena Lunak said in response to multiple inquires from Transport Topics. Without more precise information, it is not possible, at this time, to include Amazon on Transport Topics’ list of the largest logistics companies in North America. Jindel argued, however, that the gauntlet has been thrown down. “All the other 3PLs should be more afraid to realize that they have been overtaken so fast and to such a great extent,” he said. Jeremy Bowman, an analyst who follows Amazon at The Motley Fool, an investment firm in Alexandria, Va., said there is growing evidence of Amazon’s intentions to compete in logistics and delivery services. Bowman noted that logistics is a huge market, with global revenue projected to reach $15.5 trillion by 2023, according to Transparency Market Research. Bowman also draws a comparison to Amazon’s cloud computing business. “Amazon Shipping seems to resemble Amazon Web Services, which it originally developed as an in-house project to serve its own e-commerce needs, but is now the biggest enterprise cloud business in the U.S. by adoption,” he said. AWS posted an operating profit of $7.3 billion in 2018.